Counting Beyond Cranes: the Annual Midwest Crane County by Brian Barch; North American Crane Shirts! ; A D.A.R.ing start by Marianne Wellington; A Long-time colleague joins the ICF team by Kerryn Morrison; ICF Members: mark your calendars; Travel with George; New Bird-a-thon Challenge for 2006 by Bob Lange. 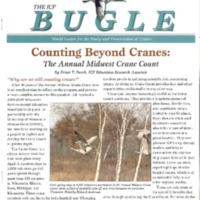 International Crane Foundation, “ICF Bugle February 2006,” Crane Media Collective, accessed April 25, 2019, http://gallery.savingcranes.org:8082/items/show/16330.